We made OmegaBrite for you. We are committed to providing you with the highest level of customer service. Please feel free to contact us if there is anything we can do for you. We want to make you happy. To Order By Phone, Call Toll Free: (800) 383-2030 To Order By Fax: (781) 652-0504. Our Customer Service Hours are from Monday – Friday, 8:00 AM – 4:00 PM EST. What amount of EPA in Fish Oil is most beneficial? The amount of EPA Fish Oil in Omegabrite capsules contains 350 milligrams of EPA and 40 milligrams of DHA. We recommended taking 3 OmegaBrite Omega 3 fish oil capsules daily, which contain a total of 1050 milligrams of EPA. Always check with your doctor to find what is best for you. Yes, you can. Please fax your order to 781 652 0504. How can I return my order and what are your return policies? If you are not entirely satisfied with OmegaBrite, you may return the product within 30 days and you will receive a refund, minus shipping and handling. Simply mail the product back in the box it came in to the address listed on the packing slip. You shipping email will contain a tracking number for your convenience. We ship within 2 to 3 business days. Delivery time is between 5 and 10 business days. How can I order OmegaBrite? You can order online at by clicking here or call 1800-383-2030. What studies have been done using OmegaBrite Gelcaps? A study at the Pediatric Psychopharmacology Research Unit, Massachusetts General Hospital, Boston, MA, was completed using OmegaBrite which showed it to be as effective as atypical antipsychotics in rapid reduction of mania in children. 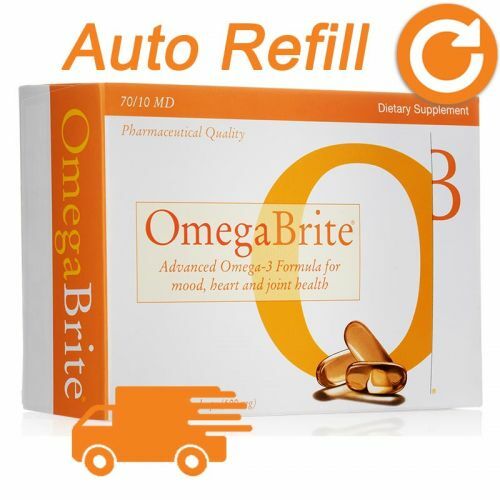 OmegaBrite was also used in a study at Ohio State University that showed that OmegaBrite reduces both the perception of stress and the biological indicators of stress in a non-health condition impacted population. OmegaBrite is also being used in several other studies at major medical centers on depression, ADHD and bi-polar disorder in adults and ADHD, depression, bipolar and autism in children. What is the total amount of EPA/DHA in the OmegaBrite KIDZ product? There is a total of 57 grams of EPA fish oil and 13.5 grams of DHA in one bottle of OmegaBrite KIDZ. How can I take OmegaBrite if I can’t swallow a capsule? Customers who have difficulty in taking OmegaBrite capsules should consider taking our Kidz product (liquid) as an alternative. You can also pierce the gel capsules with a sterilized pin and squeeze the oil into a drink or yogurt. Can I take more OmegaBrite if I need it? Our customers often increase their dosage after several weeks to increase their response. Many customers experience higher benefits from increased dosage. You can safely take up to 8 capsules a day. Based on the recommended serving of three capsules per day, a box will last for 20 days. We generally recommend that customers initially take 3 capsules a day. You should also consult your doctor. Can I take OmegaBrite with medication? OmegaBrite is a food supplement rather than a form of medication. Omega-3s are GRAS (Generally Regarded as Safe), therefore, it is generally safe to take in conjunction with medication but you should consult your doctor first. Should I refrigerate or freeze OmegaBrite? No, Refrigerating or freezing are not recommended. Store OmegaBrite in a cool, dry place. What fish is OmegaBrite from? The fish oils used in OmegaBrite originate from sardines and anchovies from the cold, clean waters off the coast of Chile and Peru. OmegaBrite starts from small anchovies and sardines off the coast of Chile and Peru. The oil from these small, pure fish is then distilled and concentrated. Meticulous testing is completed before and after each stage of manufacturing. At all stages, nitrogen blanketing and nitrogen flushing is utilized to prevent oxidation and keep OmegaBrite tasting great. The oil, capsules, and then finished product are transported with the highest care, often utilizing refrigerated trucks and cooling blankets to ensure customer satisfaction. After even more testing and quality care the final orange box is delivered to your door step. How is OmegaBrite tested to be free of mercury? As part of our strict quality control program, we test every batch of OmegaBrite for dioxins, PCB’s, Mercury and other heavy metals. OmegaBrite test results meet or exceed the purity standards of California Proposition 65 and the Council for Responsible Nutrition. Why is protecting the product from oxidization so important? Oxidization can affect the taste and smell of omega-3 oil. OmegaBrite takes great care to prevent oxidation. From using cooling blankets, to refrigerated trucks, to nitrogen blanketing and nitrogen flushing, we are leaders in the industry in preventing oxidation. No, however we are third-party tested by Consumer Lab and members of the IFOS program. What are Arachidonic acid (AA) and Alpha Linoic Acid (ALA)? Arachidonic acid is a 20 carbon omega-6 fatty acid with 4 double bonds. Omega-6 fats are polyunsaturated with the first double-bond beginning with the 6th carbon atom from the methyl end of the molecule. An 18 carbon Omega-3 fatty acid with 3 double bonds. Alpha-linolenic acid is found in flaxseed and other plant oils. Note how just 3 double-bonds alters the chemical structure, making alpha-linolenic acid much more highly folded than an 18 carbon saturated fat. What are EPA Fish Oil and DHA Fish Oil? Eicosapentaenoic acid (EPA) is a type of omega-3 that is essential for healthy immune function, cardiac function, mood, joint, eye, and brain health. Docosahexaenoic acid is also an omega-3 fatty acid. DHA is crucial for neurological and visual development in the human fetus and newborn, and is found in high concentration in the brain. EPA fish oil and DHA fish oil are only found in seafood and marine algae. Why are Omega-3s from plants (such as flaxseed oil) ineffective in most people? Some people can convert EPA and DHA from ALA, but many cannot and therefore often times people may not receive the full benefits of omega-3s from only consuming plant based products. Even for people who can convert ALA into EPA and DHA, the conversion rate is very small. Only 5% of ALA can be synthesized to EPA. Less than 0.5% of ALA can be synthesized to DHA. What are the benefits of omega-3 fish oils vs omega-6? Omega-3 fish oil is an anti-inflammatory molecule. Omega-3s may improve many conditions such as: high blood pressure, arthritis pain, inflammation and depression. Omega-6 is an inflammatory molecule and competes with omega-3 for the same chemical receptors in the body. Omega-6 is important in the body as it promotes inflammation but it is abundant in western diets. Many people may find it beneficial to lower their omega-6 levels and increase their intake in omega-3. Can’t I just eat more fish? A lot species of fish, specifically larger fish, may contain toxins. OmegaBrite is rigorously tested at every stage of production for impurities, toxins, and PCB’s. Is OmegaBrite a drug and will my insurance pay for it? OmegaBrite is food supplement. Please check with your insurance company for their terms. Does OmegaBrite have any side effects? OmegaBrite is food supplement so there are no side effects. It is best taken with a meal. Does OmegaBrite have any aftertaste or smell? OmegaBrite is manufactured in an oxygen-free environment, using nitrogen flushing and nitrogen blanketing technology. This reduces oxidation which prevents any aftertaste or smell. Results vary between individuals. You may notice a difference in a few days or it could take a few weeks. It can take several months to balance your omega-6 levels. You need to continue to take OmegaBrite to maintain the benefits. How is OmegaBrite different from other products on the market? The key differences of OmegaBrite are the purity, concentration & our unique 7:1 high EPA ratio. 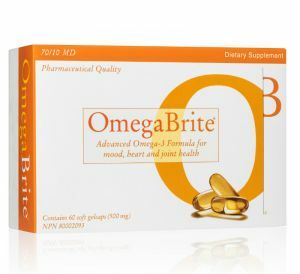 OmegaBrite is the only omega-3 to test every batch before, during, and after production. 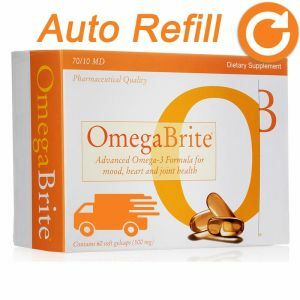 OmegaBrite is the purest omega 3 supplement on the market today. OmegaBrite is 100 percent natural. It is formulated by doctors to give you the highest quality omega 3 product.